One of the many things I love in life is Sailor Moon. If you read my mid-2018 life update post then you’ll have noticed that I even got myself a Sailor Moon tattoo. I first discovered Sailor Moon back when I was a kid. I remember watching the series on ITV on a Saturday morning and being totally amazed by it. It’s one of those things that has aged well and will forever have a special place in my heart. 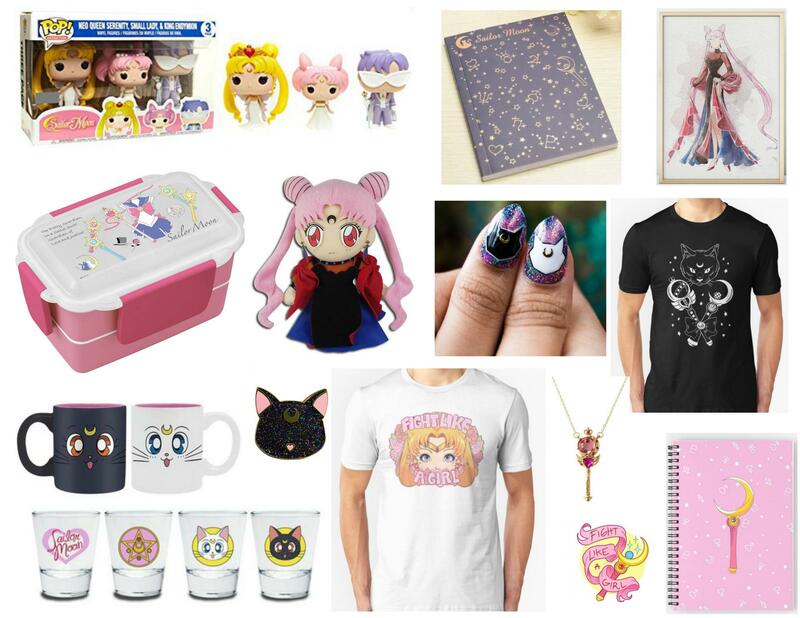 So on that note, recently I was browsing online and discovered loads of funky Sailor Moon items. So here is my little wishlist featuring a few of the awesome items I discovered. When it comes to clothing and accessories I discovered quite a few Sailor Moon themed items. The first item I discovered was the Glittery Luna Pin. This is a pretty little pin that would look awesome on my pentagram bag which I mentioned in my July 2018 favourites. The second and third items I discovered were both T-Shirts. The first is the white coloured Fight Like A Girl T-Shirt. I love the slogan on this because let’s be honest, females are strong as hell. The second of the tees is the black coloured In The Name Of The Moon T-Shirt. I love this as it has a very witchy vibe about it and features a great depiction of Luna the cat. The fourth Sailor Moon themed item I came across was the SM Necklace. This is a super pretty piece of jewellery that would be loved by any Sailor Moon fan. I do however wish it came in silver rather than gold. However, that is just personal preference I guess. The fifth item I came across was a set of Luna and Artemis Inspired Press On Nails on good old Etsy. I think these are freaking awesome. I love everything about them from the colour to the shape. They are simply gorgeous. I also discovered a nice little range of Sailor Moon homeware when browsing the web. The first homeware item I discovered was the set of SM Character Shot Glasses. I’m not a big shot fan but these are right up my street as they feature Luna and Artemis’ adorable faces. I also spotted the Luna & Artemis Mug Set. However, as Peter very kindly got me a Luna & Artemis 2-in-1 mug as well as a funky heat-changing Sailor Moon mug, I’m really restraining myself from buying this cool set. And the final two Sailor Moon homeware items I discovered were two prints. The first is the Fight Like A Girl Print. This print is so colourful and funky and much like the tee I mentioned earlier, features a great slogan. The second print is the Black Lady Water Colour Illustration. This print is simply stunning and features one of the most beautiful characters in the whole series, Black Lady. Well in my opinion anyway. The colours are lovely and the entire design is stunning. The rest of the items I came across were all pretty random. I mean I came across both the Moon Stick Notebook and the Moon Stick Crystal Notebook both of which are so cute. However, I don’t really need any more notebooks if I am honest. One thing that I did come across that would come in handy for work lunches was the SM Bento Box. This is a jazzy take on standard tupperwear and would for sure get some good use from me. While browsing the web I also spotted something I’ve wanted for a while, the Queen Serenity Small Lady King Endymion Funko Pop Set. If you read my recent post on my love of Funko Pop figures then you’ll know I’ve got pretty much all the Sailor Moon Pops. However, I am missing this set. One day I’ll get my hands on it and then my collection will be totally complete. The final item in my Sailor Moon wishlist? The Black Lady Plush. Do I need it? No. Do I love everything about it? Hell to the yeah. Are you a Sailor Moon fan? Next Post Is The Deadpool as Bob Ross Funko POP! Really THAT Cool?